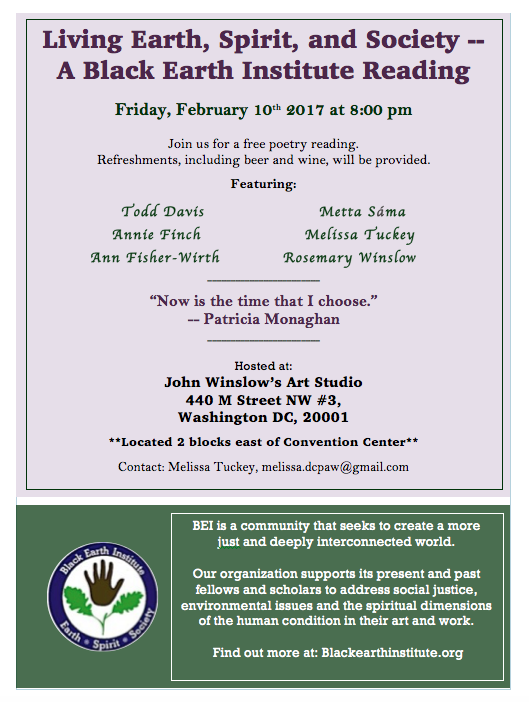 Join Black Earth Institute for a Fellows Reading during the AWP Conference weekend in Washington DC!! We will be hosting a reading at John and Winslow’s Art Studio, at 8:00 pm on Friday, February 10th. Refreshments, including beer and wine, will be provided. Work will be presented by: Todd Davis, Ann Fisher-Wirth, Annie Finch, Metta Sama, Melissa Tuckey, and Rosemary Winslow. The AWP Conference will be held at the Walter E. Washington Convention Center & Washington Marriott Marquis. John Winslow’s Art Studio is located half a mile away, about 2 blocks east, from the Convention Center.